Botrytis is a genus that is classified as an anamorphic fungi and belongs to the family Sclerotiniaceae. The fungus has been shown to infect and affect a wide range of plants in various climates across the world making the group an important point of focus in agricultural systems. While the genus consists of a number of well known plant parasites, some of the Botrytis species have been shown to live as saprophytes in various environments around the world. Botrytis fungi exist in the environment as parasites or as saprophytes. Since they can infect a wide variety of plants, these organisms can be found in an array of environments across the world. To grow and develop successfully, they require cool and moist environments. As such, they can be found in virtually all environments with conditions infecting a variety of plants. On well, saprophytic Botrytis fungi can be found on farms, in forests and other such environments where they live and obtain their nutrition from dead and decaying matter. In favorable environmental conditions, the spores of Botrytis fungi can survive and germinate to continue with the life cycle when conditions improve. * Botrytis fungi produce different types of spores. Whereas some of these spores have a protective cover that allows them to survive during extreme conditions for extended periods of time (winter, lack of nutrition etc.) others can only survive for a limited period of time (from a few weeks to about 3 months). Adaptability refers to the ability of an organism to adapt/adjust to different conditions around them. According to a number of studies, Botrytis isolates were shown to be able to change with every generation making it possible for the species to adjust to various changes in their environment. In species like B. cinerea, studies have also shown there to be genotypic and phenotypic variation, providing additional evidence for changes between successive generations. It has been made possible for various species in this group to develop resistance against various fungicides. This is an important characteristic that enables Botrytis to live in a wide range of environments (tropics, subtropics as well as cold regions) where their host grow. To date, well over 30 species of genus Botrytis have been identified. More species are continually being discovered, which means that many more species are yet to be found and described. 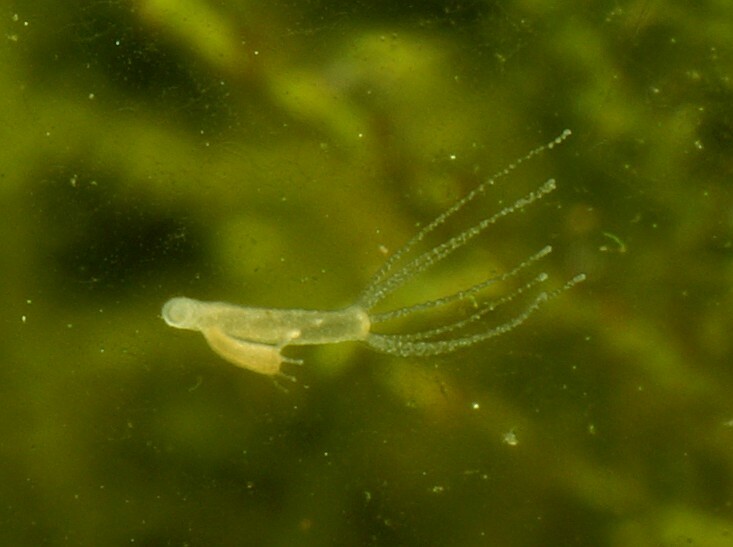 Some of the species discovered recently include B. deweyae and B. sinoalii among others. A majority of the species have been shown to only infect a few hosts with some only affecting given specific hosts. The only exception here is B. cinerea, which has been shown to affect well over 200 plant hosts ranging from monocots and dicots to macro algae. As such, B. cinerea can be found in many more niches in the environment compared to the other species. Botrytis is regarded to be a genus of anamorphic fungi, which means that they mostly reproduce asexually. The life cycle of Botrytis fungi starts with the production of vast amounts of asexual spores (conidia) from the tips of fungi's conidiophores. The spores start to germinate when they land on the surface of the host plant. This is also dependent on such factors as temperature, moisture and sunlight among others. During the winter period, Botrytis species produce sclerotia, which are melanized resting bodies. Compared to the normal conidia produced in spring or warmer conditions, sclerotia are more hardened (due to the presence of melanin) which allows the spore to survive the extreme environmental conditions (overwintering). Inside this dark, hardened cover, the sclerotia contain a mass of hyphal threads that start germinating when environmental conditions improve. * Compared to sclerotia, species of genus Botrytis also produce chlamydospores which are temporary resting bodies. This allows the spores to survive for a limited period of time during tough environmental conditions. Once the spores land on the host plant surface, they start to germinate; producing germ tubes within a few hours. This is followed by the development of such structures as appressorium (specialized flattened hyphae from which the penetration peg develops). As these structures continue to develop, such enzymes as cutinases and lipases are secreted at their tips to act on the cuticle and ensure successful penetration of the fungi. This usually takes an average of 6 hours. Following penetration, the penetration peg and other hyphae continue to grow into the epidermal cells while producing a range of chemicals and metabolites that cause damage to the host plant cells. The fungus Botrytis cinerea has been shown to also produce molecules (small RNA) that affect the plant's immune system, making it difficult for the plant to protect itself from the invader. Following the death of the plant, fungi like Botrytis cinerea have been shown to live as saprophytes (or nectotrophs) where they continue living and feeding on the cells of the dead plants. Conidiophores that are produced in the process release spores that may land on other host plants or on soil and continue the life cycle. * Sexual reproduction in Botrytis species is yet to be fully understood. However, some strains have been shown to have a sexual stage in their life cycle. While members of Botrytis have been shown to change from one generation to the next depending on the conditions in their environment, there are a number of unifying characteristics that are common in a majority, if not all the species in this group. They are anamorphic fungi - As anamorphic fungi, also referred to as Fungi imperfecti, members of the genus Botrytis produce asexually through their spores (conidia). However, sexual reproduction in the life cycle of some strains (of some of the species) is being studied. They are filamentous fungi - This means that they produce thread like structures (hyphae). These are particularly important for the fungi for penetration into the host plant and reproduction. The conidiophores of these fungi range in color - (grey to brown) and size (750um to about 2 mm) in length. Depending on the species, these structures may be long and smooth or shorter in length. They may produce macro or micro-conidia - These types of conidia also vary in shape and size. For instance, whereas some may be ovoid, others may appear globose or ellipsoidal. Genetic studies of the genus Botrytis has shown the group to be very genetically diverse. In particular, this has been shown to be the case with Botrytis cinerea, which has a number of strains divided into two main groups: Group I and Group II. Among other differences, strains in these groups have been shown to significantly vary in their morphology and genetic diversity, which accounts for the wide variety of their plant hosts. 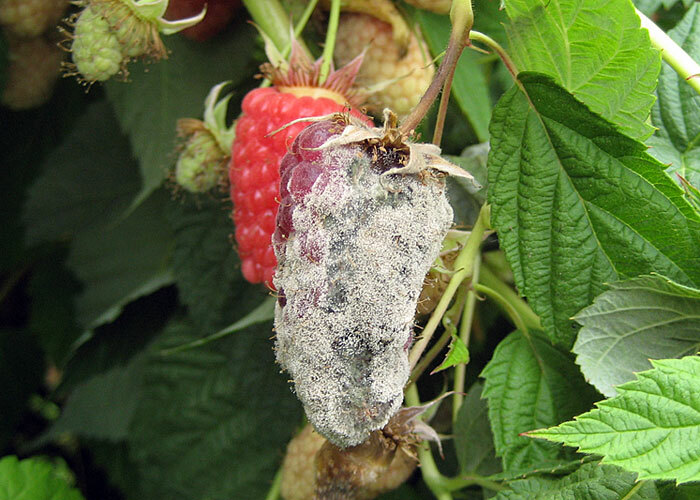 Among the species of the genus Botrytis, B. cinerea has been shown to cause the majority of plant diseases in a wide variety of plants from ornamental and fruits to vegetables. This is largely due to the fact that the species has been shown to be a complex with an array of strains with great genetic variance. 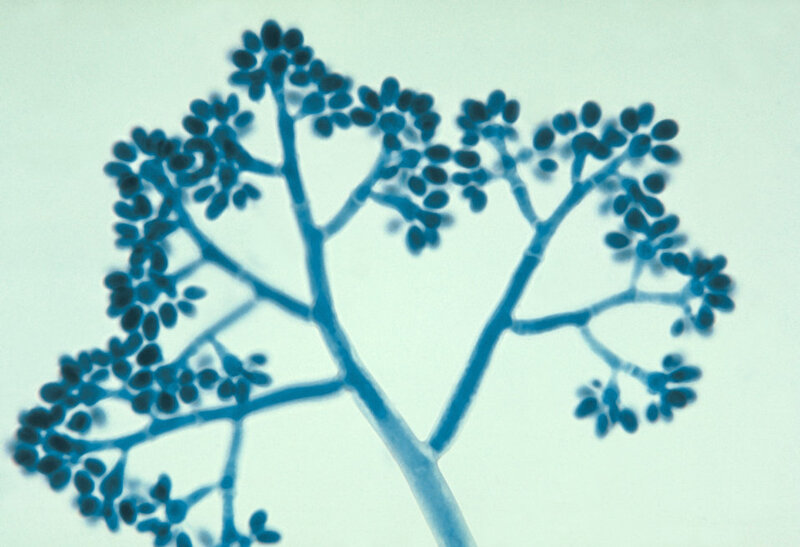 When the spores fall on the surface of the plant (seed, fruits etc.) they first obtain nutrients from the wounded part of the plant surface. For instance, sugary juices from a wounded fruit provides nutrients that would activate the germination of the spore. This activation causes the spore to grow and penetrate the plant more aggressively ultimately causing the plant to die. Here, the infection may first appear as a whitish growth that ultimately turns gray or grey-brown in color. This mass is composed of numerous spores that can be easily dispersed by wind or insects. Given that the growth of the fungi is largely dependent on moisture and favorable room temperature, one of the best ways of managing grey mould has been shown to involve the reduction of humidity and increased flow of air. In addition, the use of sub-irrigation and ensuring good hygiene is recommended as a means of managing the disease. Avoid plants that are at a high risk of being infected. Alternate plants to control the infection. Due to the wide variety of plants they affect and the significant damage they cause to these plants, Botrytis cinerea strains have attracted significant research studies over the years. Using the following simple procedure, students can grow and identify the morphology of this fungi. * The use of water agar helps in the sporulation of some fungi. Observation of the isolate under the microscope will reveal conidiophores and conidia of different lengths. Students can compare the structures of different types of organisms to determine differences in length, size of conidia and their morphologies etc. Members of the genus Botrytis, particularly Botrytis cinerea, have been shown to have negative impacts on plants. This is because they are pathogenic organisms that cause a variety of plant disease. Contributing to biomass - Apart from causing plant diseases, members of Botrytis can also live as saprophytes. This means that they can survive by feeding and thus further causing the decomposition of the plant. While this results in more spores and infections, it also contributes to decay and consequently contributes to the biomass. This can benefit other plants and contribute to their growth if the fungus is prevented from multiplying and infecting other plants. Wine industry - Botrytis cinerea has been shown to cause water lose in grapes which in turn increases the concentration of the natural sugars of the grapes. In this case, the fungus causes what is regarded as "Noble rot" where dehydration of the grapes does not affect the sugar level. Compared to other wines from other unaffected grapes, the wine from these affected grapes has been shown to be sweeter and more viscous in addition to having a unique flavor. B. Williamson, Y. Elad and Nafiz Delen. Botrytis: Biology, Pathology and Control. Originally published: 2004. Bahar Morid and Hossein Bayat. Morphological and Molecular Identification of Botrytis Cinerea Causal Agent of Gray Mold in Rose Greenhouses in Centeral Regions of Iran. January 2010.